This sterling silver charm is in the shape of an Irish road sign. This Irish charm has been hallmarked sterling silver by the Irish Assay Office at Dublin Castle in Ireland. This sterling silver Irish charm features the word Ireland with enamel accenting inside of a road sign shape. 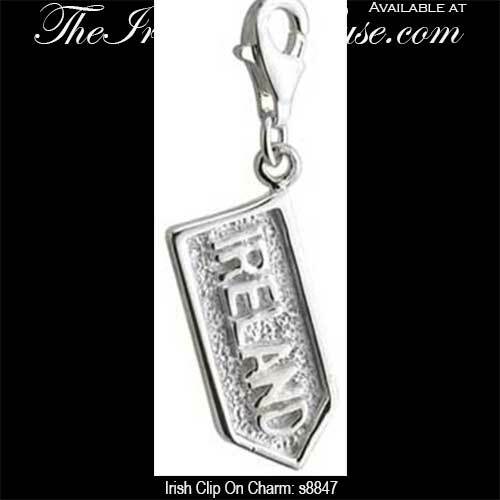 The Irish clip on charm measures 3/8” wide x 1 1/4" long and it includes a lobster claw catch. This Irish charm made by Solvar Jewelry in Dublin, Ireland and it is gift boxed complements of The Irish Gift House.